Play it in the car with all the windows down, and watch out for jealous stares. 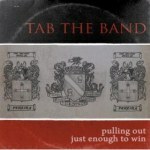 TAB The Band is a melodic guitar rock band with a healthy dose of Mick Jagger vocal snarl. This act also has a wonderful sense of humor. When they say of a girl, “she’s an Alex not a Mallory,” it’s just the sort of Family Ties reference that makes my day. Nothing on Pulling out Just Enough to Win is all that complicated. Instead, TAB The Band does the simple stuff extremely well. “Secretary’s Day” is a chugging rocker, which doesn’t feature a whole lot of sonic dynamics. But it doesn’t need any frills. So rather than turning the studio into some kind of an aural LSD experiment, these guys plug in, turn it up, and smash the joint. This is crazy beautiful driving music. Play it in the car with all the windows down, and watch out for jealous stares.